Today... I MUST finish all of the TAX stuff...tomorrow is our appointment. I am going to be better at keeping everything tallied each month. This waiting until the end of the year is for the birds. Jack left for a fun breakfast with one of his friends so the house is nice and quiet...aaaaahhhhh! It helps me to concentrate better. I remember when I was young... I had the TV on ALL THE TIME ... for noise and company. Isn't it funny as you get older... the quiet is your best friend? I'm in the process of working with an artist (Tom) in making beautiful, beautiful, beautiful seam rippers for all of us.... to purchase. He hand turns all of the handles from beautiful woods, uses gorgeous large beads made from another artist...then adds silver to the end of the handle...or gives it a silver band. 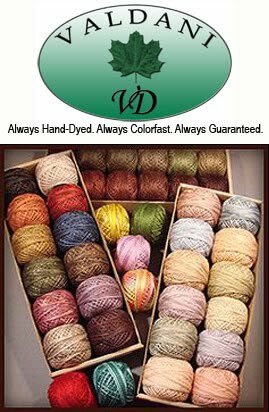 MANY, MANY of us gals that hook (wool rugs...!) have his hooks. They are simply exquisite. So... now all of us that sew... can have beautiful scissors AND seam rippers! As they progress in their HAND manufacturing... I'll keep you posted. Once you see one... YES... you will want one of your very own. TRUST ME! I found some cool things from a website .... LOOK!!! 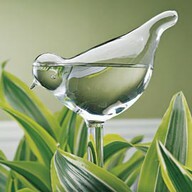 This little fellow (you get a set of two) waters your plants for you...especially when you are away from home. Isn't he adorable???? 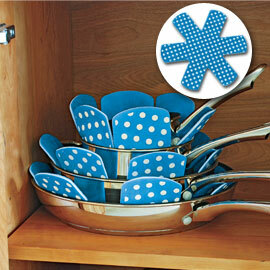 I love these protectors too... and they can be used for more than just your fine pots and pans! What about with your large beautiful crock bowls? It protects from scratching but it could also protect from chipping!!! Love the polka dots!! Then... this sweet thing! 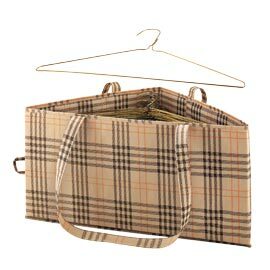 I don't know about you... but my closet either has a HUGE extra supply of hangars... and I only notice that when I DON'T NEED ONE. However, have you ever noticed that when you want a hangar... there are NONE in your closet. This happens to me all of the time. I'll be picking up stuff...go to hang something up and Jack will have taken all of the spare hangars (even from MY SIDE of the closet) and transported them to the laundry room. I think I'll have to have a chat with him and ask they he PLEASE leave me at least ONE HANGAR that is empty. It's just one of those pet peeves that DRIVES ME NUTS! This storage bin even has a handle on it... PLUS.. if you are not using it...it too can hang... see the little loop on the end. Now.... WHY DIDN'T I THINK IF THIS??? There I go ... with another question for GOD... why do some of us get to think of great things... then there are the rest of us that wish we could? 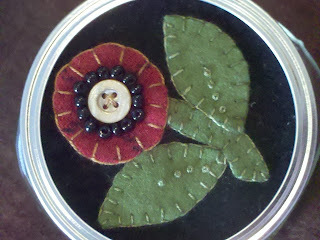 Ok... we had our first Sunday - B-a-a-a-d Girls Club and the gals all be finishing up the two projects below. The crow needle-keep and the Wooly Jar for their thread cuts and small trimmmings. They show it from an outside window sill... it does have pine cones and red berries in it but kind of hard to see. 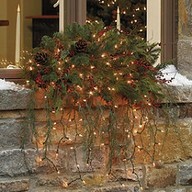 You MUST use either green or dark brown wire lights (hard to find...) so the white ones don't pop out in color too much. I think this would be lovely on a large mantle - flowing down over the fireplace OR from the top of a beautiful cabinet! Then... I would be adding some of my TALL hand carved or primitive Santa's in the center of it... or SNOWMEN.. they would look adorable too. I know it's VERY EARLY for Christmas decorations... but just couldn't resist this one. "mmmmmm........ do I smell carrots?" "oh my gosh...this heartburn is killing me!" 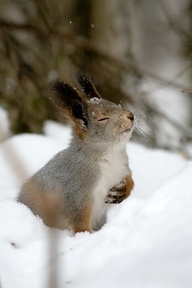 "Please Lord, let it be spring soon!"